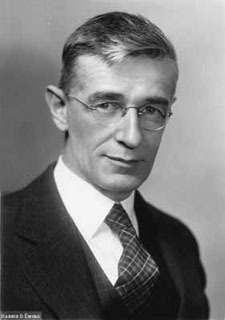 Vannevar Bush (1890-1974) was an American engineer, inventor and science administrator. In 1940 the National Defense Research Committee was established and President Roosevelt appointed Bush as its president. A year later the Office of Scientific Research and Development was created, absorbing the NDRC, with Bush as director. This latter organization oversaw the Manhattan Project and the development of the atomic bomb. In October 1941, Bush informed Roosevelt of the conclusions of the British MAUD Report, which concluded that an atomic bomb was feasible and could be produced in time to affect World War II. In response, Roosevelt gave Bush his approval that fall to construct and develop the bomb. Throughout the war, Bush combined the work of the US military with research from universities, including MIT, Harvard, and the University of California, Berkeley, to speed up improvements in weapons technology. Bush served on the Military Policy Committee, was actively involved in recruiting scientists, and advised Secretary of War Henry Stimson and others on the future international implications of the atomic bomb. In 1944, Roosevelt asked Bush to suggest future peacetime applications of the technologies developed during World War II. The next year, Bush submitted his famous report "Science, the Endless Frontier," which led to the creation of the National Science Foundation in 1950. He served on the National Science Foundation's Advisory Committee for several years, then became chairman of the MIT Corporation, with which he remained involved for the remainder of his life. In 1945, Bush published the article "As We May Think" in the Atlantic Monthly. This described an imaginary device known as the "memex," an automated information management system that later inspired many of the creators of the Internet. 1890 Mar 11th Born in Everett, Massachusetts. 1913 Graduated from Tufts College with a B.S. and M.S. in electrical engineering. 1917 Received a joint Ph.D. from MIT and Harvard.